More than a decade ago, Halloween here meant watching reruns of horror classics on television and munching on skull-shaped candy. Next week, however, when the spooky day rolls around again on Oct 31, party ghouls will have their pick of at least 20 Halloween-themed events, including a murder mystery, hair-raising storytelling sessions and night treks to the spookiest parts of Singapore. Travel and lifestyle website Go Away has teamed up with avid trekker Ho Ee Kid from adventure group Luv@Adventure to curate two night trails to Changi and Bukit Brown for the first time this Halloween. Go Away's editor, Ms Tan Lili, 30, says: "What better way to celebrate Halloween than to explore allegedly haunted locations at night with a group of like-minded people? "These treks are also designed to educate trekkers about Singapore's rich history." Not satisfied with existing Halloween events, four friends have come together to cook up a murder mystery game titled Changi Revisited: The Hendon Horrors. 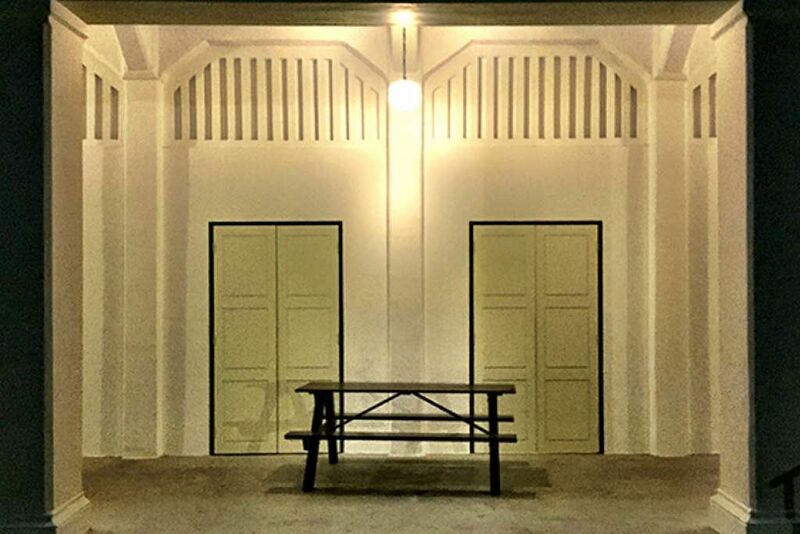 A whodunnit delivered in the format of an escape game, it is set in the former grounds of Changi Barracks. Co-founder Azizul Kamal, 27, a lawyer by day, says: "Consumers are looking for a different way to spend Halloween rather than risking heart attacks at scary theme parks or hitting the clubs in costume." Tickets for the four-day event, from today till Sunday and next Friday, have been selling fast and Oct 31 has been added to meet demand, says Mr Azizul. For its first anniversary, monthly storytelling initiative Telling Stories Live wanted a specially themed edition. The group's co-founder Petrina Kow says: "Fellow co-founder Shireen loves ghost stories and I love themed parties. Also, we came across a few interesting people with great ghost stories and we thought, 'Why not have a Halloween edition?'" The session on Oct 31 at The Fabulous Baker Boy cafe will have four storytellers, including a professional ghost hunter and a cemetery researcher sharing first-hand accounts of their encounters with the afterlife. Food and beverage businesses are cashing in on the Halloween craze too, coming up with themed menus and encouraging diners to dress up on the day. Popular London burger joint Meatliquor Singapore, which opened in June, will have an Asian Pirate theme, a DJ and 3-D projection-mapping on Halloween night. Mr Jacques Dejardin, managing director of The Blind Group, which operates Meatliquor, says: "Halloween in Singapore just seems to get bigger every year and with consumers getting more dining options. It has resulted in expectations that go beyond just good food and drinks." Businesses that have done Halloween events in the past have noticed an increase in demand. Halloween Horror Nights at Universal Studios Singapore, Resorts World Sentosa's largest Halloween event, has become bigger with each edition since its first in 2011. The event has more than doubled its area in the almost-20ha theme park. Mr Jason Horkin, vice-president of attractions at Resorts World Sentosa, says: "Since 2011, we have doubled the scale of the event and have seen total visitor numbers increase more than threefold." He declines to reveal past visitor figures. The other major Halloween festival on the island, Sentosa Spooktacular - which ran for the last six years - will not be held this year. Instead, child-friendly events Spooky Junior and Spooky Seas will take place alongside Halloween Horror Nights. Ms Agatha Yap, director of sales and marketing of Sentosa Leisure Management, says this is to "cater to a wider target segment for friendly fun all year round". Meanwhile, at nightspot Ce La Vi at Marina Bay Sands, circus acts will add to the fiendish fun on Halloween. The club will feature performers from Cirque le Soir, a trendy London nightclub known for its entertaining acts. Ce La Vi's head of marketing, Ms Francesca Way, says: "We wanted to step up the game for Halloween in the club circuit this year. "Halloween in the club scene has always been about theme parties and we wanted to throw a Halloween party that will be remembered for a lifetime." Six performers - including a sword swallower, fire eater and human blockhead, a performer who hammers a nail into his nose - will be flown in to bewitch partygoers at the event. The larger range of Halloween events is music to the ears of many. Halloween buff Ilene Munas, 35, has been celebrating the event for the past five years and plans to dress up as a Star Wars character and hit a party this year. The art director says: "I think it's great that there are more options as, year after year, Halloween gets more popular here." She adds: "I doubt it will ever be as widespread as in Western countries though. There are still many people here who don't care for it." The folks at S.E.A. 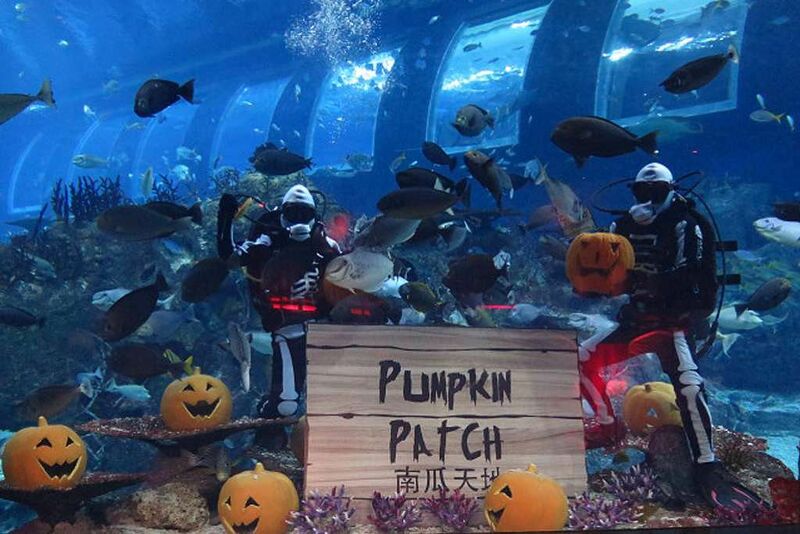 Aquarium are taking on the tradition of pumpkin carving underwater this Halloween. Divers dressed in skeleton suits will carve Halloween lanterns in the Open Ocean Habitat on weekends. Children can also embark on an adventure trail and explore the Vampire's Lair or Mad Scientist's Lab, solving puzzles and picking up treats at each station. When: Till Nov 15, 10am to 7pm daily. Weekend pumpkin-carving sessions are at 1 and 4pm. Whether your child is three or 13, there is a Halloween programme for him at the Science Centre Singapore. Plucky teens who do not scare easily can encounter popular horror characters such as the Grim Reaper, Sadako and Chucky on the Halloween Haunted trail. The younger ones can indulge in some trick-or-treating on the Not So Creepy?trail or join Dotty the young and curious monster on an adventure in the Monster Academy during the Journey Into Monsterhood show. Glide through a foggy maze on ice and come face-to-face with a 5m-tall witch at The Rink. This year, the organisers are starting the Halloween fun early in the day so that little tots can join in. Newbies to skating can sign up for a free lesson during the Halloween period. Fright fiends can get their scary fix in the Toy Maker's Maze at JCube. Children are advised to be accompanied by an adult. When: Today, tomorrow, Oct 30 and 31, 10.30am to 11.45pm. Toy Maker's Maze is until Nov 8, 6 to 11pm Admission: $23 for a two-hour session, skate boots rental included. Entry to the Toy Maker's Maze is free with purchase of The Rink's Halloween ticket. Otherwise, it is $5 to enter. If True Singapore Ghost Stories were your reading staple growing up, you will like this. One of the haunted houses - set in an underground train station with creepy inhabitants from Malay folkfore such as pontianaks, toyols and hantu rayas - was created in collaboration with the book series' author, Russell Lee. In this edition of the popular scare-fest, three out of the four haunted houses incorporate local elements, including one with flesh-eating zombies roaming a HDB block. A first for the horror nights is a dark house set in a subterranean passageway where there is no light at the end of the tunnel. Visitors have to feel their way through in darkness. Imagine being stuck in the labyrinthine pathways in Bugis Street, the shopping arcade, after the shutters have come down. The entire second floor of the arcade will be transformed into 10 scare zones where wandering Asian ghosts lurk freely, looking to enslave their next victim. Visitors can head down to the first floor to calm their nerves afterwards and indulge in some shopping at a late-night flea market or make their best terrified faces in the photo booth. Admission: Standard ticket at $45, $29 for students aged 13 and above and with a valid student ID. Exclusive online price of $25 on the Bugis Street website. 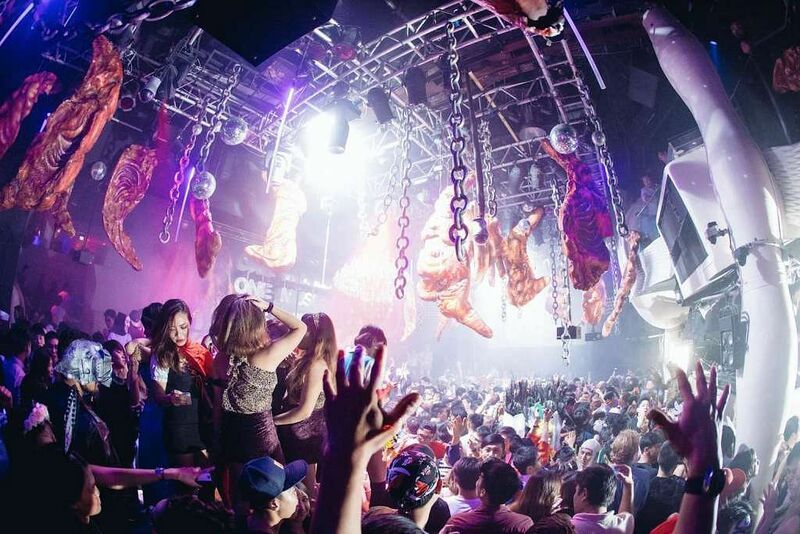 On Halloween night, snazzy nightclub Ce La Vi Singapore will be transformed into a fantastical lair for all things freaky and fabulous, as members from world- renowned London nightclub Cirque le Soir will be flown in. While grooving to the beats spun by Cirque le Soir DJ Antoine Sigaud, visitors can sip their drinks and marvel at sword swallower and nine-time Guinness World Record holder Gordo Gamsby, Julia the fire-eater and Darius the dwarf-sized entertainer. 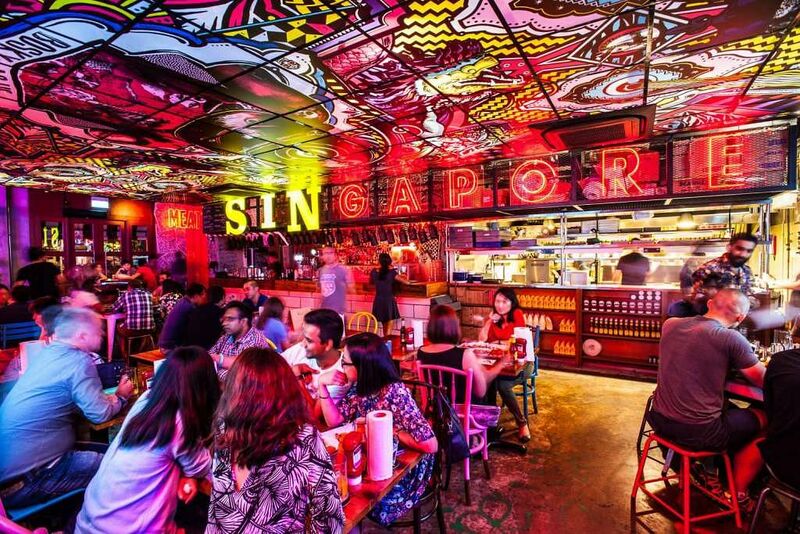 New British burger hot spot Meatliquor Singapore (right) has enlisted creative consultancy Sensory to come up with 3-D projection- mapping based on an Asian Pirate theme. There will also be party games and its own version of trick-or- treat, dubbed "trick-or-meat" - diners participate in a lucky dip to receive a complimentary drink, meaty side or a scare. French restaurant Bistro du Vin has jumped on the Halloween bandwagon and is offering dining specials named after famous horror film characters. 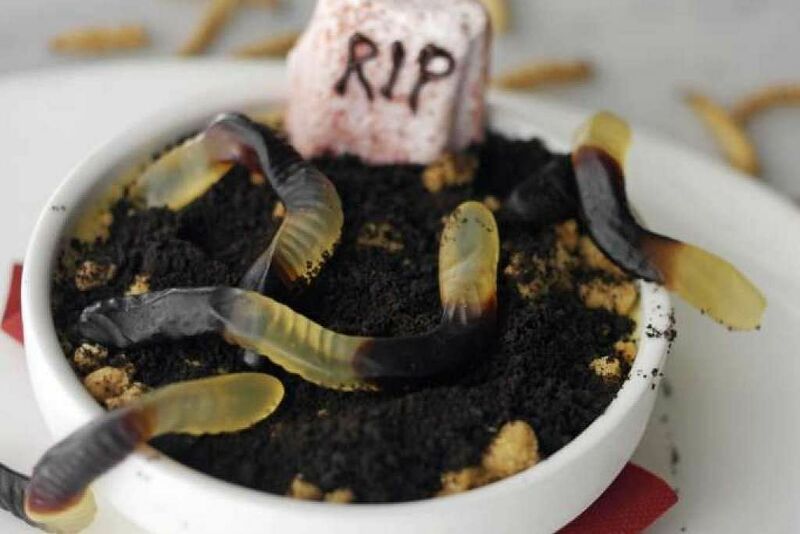 Nibble on Freddy's Delight ($26), a beef tartare appetiser, chomp on a meaty Chucky's Burger ($30) and polish off the meal with dessert Graboid's Grub ($14, above), consisting of vanilla blancmange with black soil and earthworms. Come dressed in Halloween garb and you could win a pair of Shaw Theatre movie tickets and set lunch for two at the eatery. This will be the last Halloween party at the nightclub's Jiak Kim Street premises. Pulling out all the stops with an over-the-top theme centred on a crazed witch, there will be life-sized props, installation pieces and hired talents. Go all out with your Halloween outfit as the first prize in the best-dressed contest is four return Scoot business-class tickets to Tokyo, $1,000 in cash, Roomorama accommodation and a party experience in Japan's capital. Was the Old Changi Hospital once used as a torture chamber by the Japanese occupying forces? Who are the spine-chilling spirits that lurk along Kheam Hock Road? If you are brave enough to find out, go off the beaten track this Halloween at two of Singapore's renowned spooky sites - Bukit Brown and Changi. Guide and avid trekker Ho Ee Kid will divulge hair-raising stories on spots such as Changi Beach, the Old Changi Hospital and the supposedly haunted stretch of Kheam Hock Road at Bukit Brown. Channel Sherlock Holmes as part of a team solving a murder at the fictitious Hendon Hotel, on the grounds of the former Changi Barracks, now a boutique hotel. 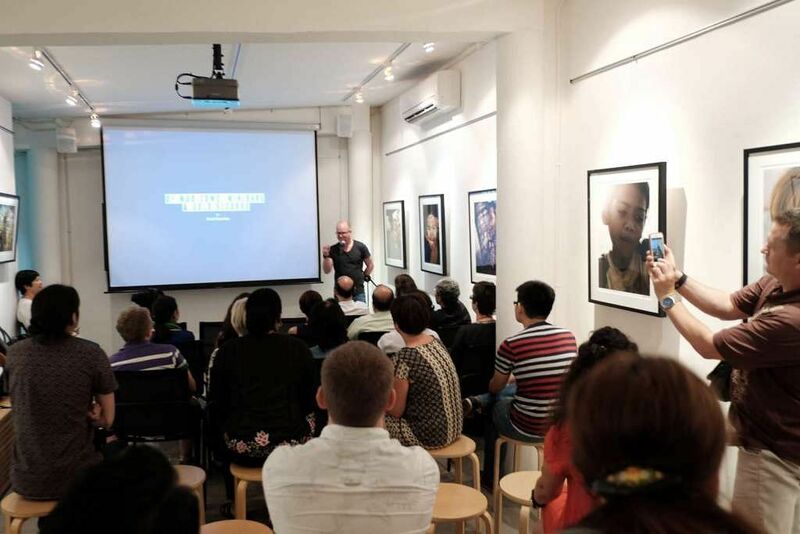 Groups of up to six members have 75 minutes to uncover clues, interrogate suspects and explore the area spanning three floors and designed to reflect Singapore in 1981. Learn about how the supernatural has inspired the arts and music at New Opera Singapore’s in augural Halloween production, House Of Horror. A selection of art songs and arias relating to the supernatural will be performed, including Hector Berlioz’sThe Damnation Of Faust and Der Leiermann by Franz Schubert, and woven together into an operatic version of the Scary Movie series. Horror films are not only about creepy ghosts and haunted houses. To show case the wide array of horror films, The Projector will be screening five films across different sub-genres, including art house horror flick Under The Skin (2014) and original slasher classic The Texas Chain Saw Massacre (1974). On Halloween night, there will also be a special screening of the cult classic, The Rocky Horror Picture Show (1975), as well as an after-party where guests are encouraged to take inspiration from the film and come dressed in their trashiest. The party will be held at the rooftop bar, The Great Escape, located at The Projector’s carpark balcony. Admission: Entry by donation at the door. $25 for the after-party. Like to hear a goose bumps-inducing ghost story? Listen as a professional ghost hunter, a cemetery researcher, an intuitive energy healer and a drama teacher recount their spine-chilling experiences with ghosts and spirits in a Halloween edition of Telling Stories Live, a monthly storytelling session. Adding to the spooky at mosphere is a live music score by musician and composer Paul Searles from local studio The Gunnery.